Mohammad’s practice is focused on litigation in state and federal courts. 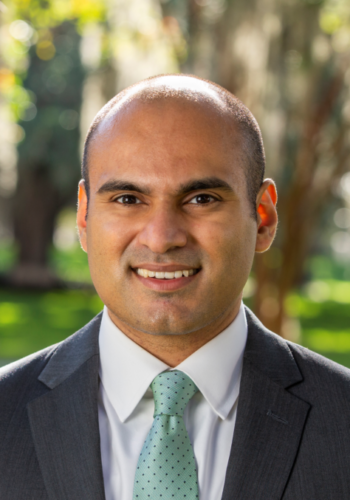 Mohammad represents clients in Clean Water Act and Clean Air Act rulemaking and enforcement cases, federal telecommunications matters, Everglades restoration, takings cases, pricing disputes, and general civil appeals. Mohammad’s advocacy extends beyond the courtroom. He lobbies both state and federal agencies on various environmental issues. In his spare time, Mohammad roots for all things Gator orange and blue. Represents Sugar Cane Growers Cooperative of Florida on Everglades restoration issues. Represents municipal interests from 8 Southeastern States on issues related to the Waters of the United States rule-making. Represents Florida’s electric, wastewater, and storm-water utilities in Clean Water Act and Clean Air Act rule-making and enforcement cases before the federal district courts, the circuit courts of appeal, and the U.S. Supreme Court. Briefed, argued, and obtained unanimous ruling and attorney’s fees from Florida Supreme Court in a case that resolved a split between the en banc First District and a panel of the Second District Courts of Appeal. Represented political consultants in litigation related to Florida’s 2012 congressional and state legislative redistricting efforts, developing and raising First Amendment argument for relief. Served as general counsel to political candidates for federal office. Principal author of amici curiae briefs before the U.S. Supreme Court in T-Mobile South LLC v. City of Roswell, Georgia (Telecommunications Act Case), L.A. County Flood Control District v. Natural Resources Defense Council (Clean Water Act Case), and Koontz v. St. Johns River Water Management District (takings case). Served as lead counsel for the City of Tallahassee in its successful defense of a case under the Telecommunications Act of 1996, and then served as lead counsel for a telecommunications provider in its successful prosecution of a case against a Georgia municipality under the same Act. Represented General Motors in its successful challenge to assessments by the Florida Department of Revenue on the value of goodwill repairs performed by dealers and reimbursed by General Motors under its case-by-case adjustment program. Represented ExxonMobil in its successful resolution of a case filed against it under Florida’s price-gouging statute. Developed strategy to convince Florida Supreme Court to recede from 20 years of precedent on civil procedure issue after termination of prior counsel shortly before oral argument. Helped major municipal utility avoid all civil penalties in Clean Water Act enforcement case. Represented major phosphate mining company in Clean Air Act enforcement matter. Numeric Nutrient Criteria in Florida: The Road to Cooperative Federalism, ABA Trends, (November/December 2015) (lead author with David W. Childs as co-author). Koontz: An Evolution – Not a Revolution – in Takings Law, Natural Resources & Environment, ABA Section of Environment, Energy and Resources Volume 28, Number 4, Supreme Court Review (Spring 2014). The Cross-State Air Pollution Rule: Will EPA Learn From Experience? ABA Trends, (January/February 2013) (lead author with Joseph A. Brown as co-author). Why Should You Care About Numeric Nutrient Criteria, ActionLine, Florida Bar Real Property, Probate & Trust Law Section (Spring 2012) (co-author with Vinette D. Godelia). EPA Imposes Strict Numeric Nutrient Criteria in Florida: Background & Implications, ABA Trends, (November/December 2011) (lead author with David W. Childs as co-author). The Statewide Stormwater Rule: A Work in Progress, Florida Water Resources Journal, (November 2010). An Eerie Erie Question: Does Florida’s Offer of Judgment Statute Apply in Maritime Cases?, 21 Fla. J. Int’l L. 357 (2009) (lead author with Judge David C. Miller as co-author) (cited by appellants and recommendation followed by en banc court in Royal Caribbean Cruises v. Cox, 137 So. 3d 1157 (Fla. 3d DCA 2014)). NPDES Update, Florida Chamber (July 2015) (moderator). Cooperative Federalism and Environmental Law, Florida Government General Counsel Association, (September 2014) (panelist). Are you liable for your neighbor’s discharges? Southeast Stormwater Association Annual Conference, (October 2014). Urban versus Rural Water Demands, American Planning Association Conference (September 2012). NNC Unfinished Business, Florida Chamber (July 2012) (moderator). Numeric Nutrient Criteria: Where do we go from here?, UF Water Institute Annual Symposium, (February 2012) (panelist). Governance Approaches to Nutrient Management, UF Water Institute Annual Symposium, (February 2012) (panelist). Tales from the Crypt: EPA & Citizen Enforcement of MS4 Permit Requirements, Florida Stormwater Association Winter Conference, (December 2011) (panelist). Update on Clean Air Act and Clean Water Act Rulemaking, Florida EHS Roundtable, (November 2011). The Gods Must be Crazy: Implications of Recent Stormwater Decisions & Regulatory Efforts, Southeast Stormwater Association Annual Conference, (October 2011). Sterile Rain: New Legal Mandates for Stormwater Utilities, Florida Stormwater Association Annual Conference, (June 2011). Listed as a “Rising Star” in the annual publication of Florida Super Lawyers, 2013-2018 editions. Listed in 2018 edition of Florida Trend Magazine’s “Up & Coming Legal Elite”.